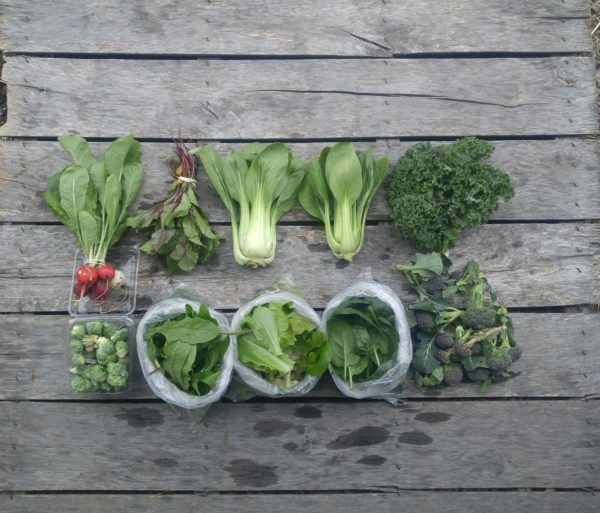 We hope you enjoyed your first week of winter produce. We totally could have delivered last week, the greenhouse is booming! There’s so much food, we had a difficult time getting some of your boxes to close. We have planned the next delivery to be Thurs. Feb 14th, two weeks from now. We harvested the crops really hard in hopes they will require the next full two weeks to re-grow before needing another picking, but there’s a small chance they’ll need to get harvested next week. We’ll do our best to stay on schedule, but if the plan needs to adjust, we’ll let you know. Radish—Everyone received Easter Egg radishes. The greens are edible, and so nutritious. Try your radishes the Eastern European way: slice of rye bread, spread with cultured butter, sliced radishes, and a sprinkling of salt. It’ll knock your socks off. Another twist? Slice them atop avocado toast. The avocado makes a great substitute for the butter. You might notice aphids on the backs of the radish tops. They’re really doing a number on a few crops in the greenhouse. They might totally take out the turnips before Feb. 14th, but we’ve got our fingers crossed. Kale—Small shares received Winterbor kale (curly and crunchy). We’ve got a great recipe for massaged kale salad that can accommodate all sorts of wonderful ingredients you might like to add- roasted brussel sprouts or sweet potatoes, nuts, cheeses, dried fruit, other greens, etc. Collard— Large shares received this crop, smooth, round leaves. Excellent braised with onion, garlic and a strip of bacon. Makes a perfectly fine substitute in any kale recipe. Mixed lettuce—This is the prettiest lettuce we’ve EVER grown. Seriously. I hope you will enjoy it thoroughly, we’re really pleased with this crop! Spinach—Super vibrant green and healthy baby spinach. Pac Choi—a couple of our tender pac choi are the perfect addition to a Japanese noodle soup, a Chinese stir fry, or a thai curry, or this sesame noodle dish! Brussel Sprouts—Our first ever successful crop of brussels sprouts! We’ve attempted this crop year after year and finally had some success. The crop is small, so this may be your only time to receive them…till next year! I recommend roasting them, cut in half, and drizzled with balsamic, tossed with sesame seeds or sunflower seeds the last 5 minutes of roasting and then throw them into one of the many salads you’ll be making this week. Beet Thinnings—When you seed crops thickly to get good germination, you have to thin them out as they grow to prevent overcrowding. We thinned the beets today and you get to enjoy the product! We’ve been chopping these delicate tender greens into our cast iron skillet and doing veggie scrambles each morning. They are also tender enough to get mixed into a salad, and they’d be wonderful roasted, too. Dandelion Greens—These young greens are super tender and perfect to be blended into a salad with our lettuce mix. Dandelion greens are strongly flavored, so I recommend using them at 20-30% of a salad mix. They’re also excellent cooked, braised, scrambled, etc. They’re super healthy for your liver, too! Broccoli—We don’t have a ton of it left, but still a little bit for you to enjoy. The sweet potatoes will prefer to stay at room temp, but everything else will keep longest stored in the fridge sealed up in a bag. All root crops should be severed from their tops to keep the roots from getting rubbery. Everything will need a gentle washing before cooking, but leave the dirt on until you’re ready to use them to prevent spoilage. 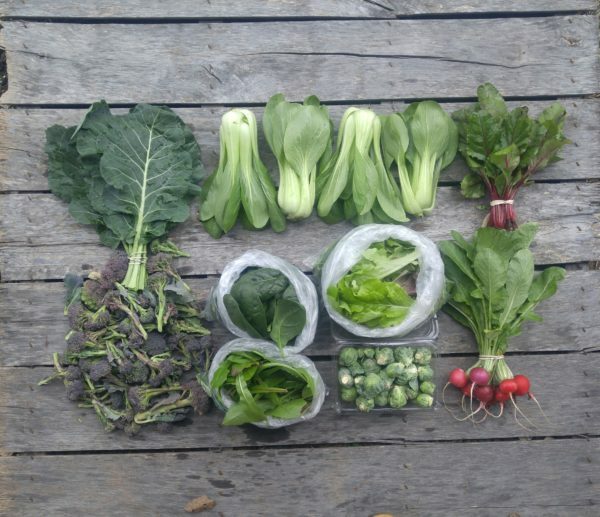 Large share: (top row, left to right) collard, pak choi, beet thinnings, (2nd row)broccoli florets, bagged spinach (above), bagged dandelion greens (below), bagged lettuce mix above Brussels sprouts, and Easter Egg radishes. Small share (top row left to right) Easter Egg radishes, beet thinnings, pac choi, kale, (second row) Brussels sprouts, dandelion greens, lettuce mix, spinach, and broccoli florets. Kale chips! This batch of kale is the best yet! Preheat oven to 300. Wash kale and Pat dry. Tear into chip size pieces. Put in ziplock bag with sprinkle of olive oil and sea salt. Spread on foil lined pan sprayed wbPam. Bake 10 minutes, turn and bake 10 more minutes. Let them sit for a few minutes if you can stand it! Oh man, sounds delicious, Mollie!